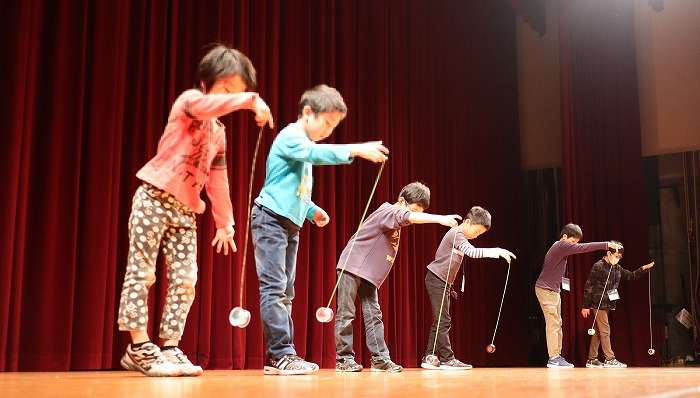 First ever Iwakura City Kids Yo-Yo Contest! 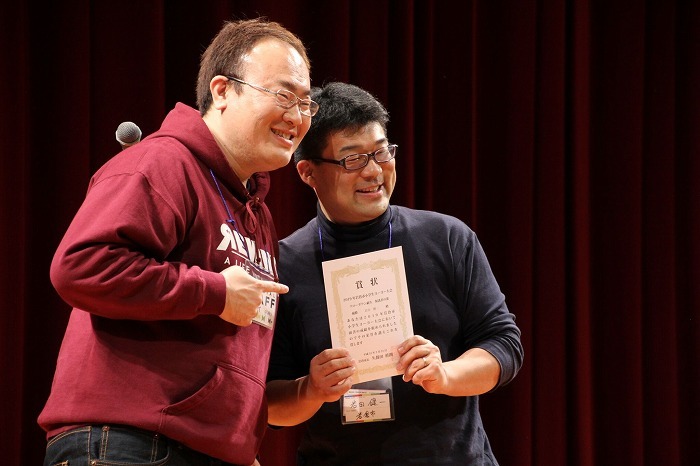 Iwakura City and REWIND partnered up to organize a city-wide kids event on March 21. Many local kids and parents showed up and enjoyed a day with yo-yo! 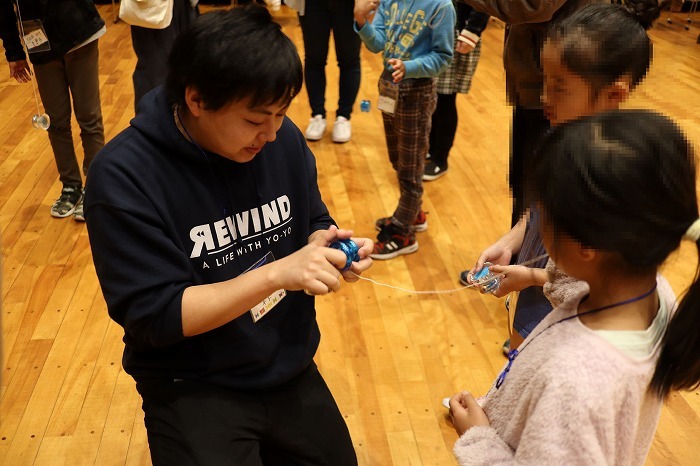 REWIND has been working together with Iwakura City, our hometown, to promote yo-yo as one of the many charms of the city itself. 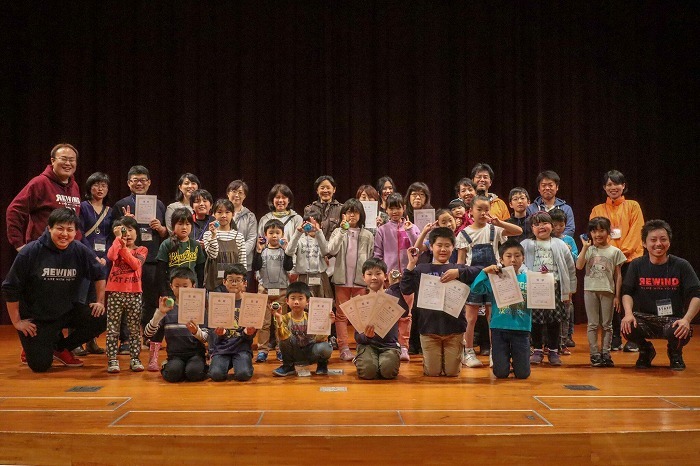 Last year, we gave away Sakura Stream yo-yos to all the 4th grade students in Iwakura and had a performance and teaching session in all five elementary schools in the city. 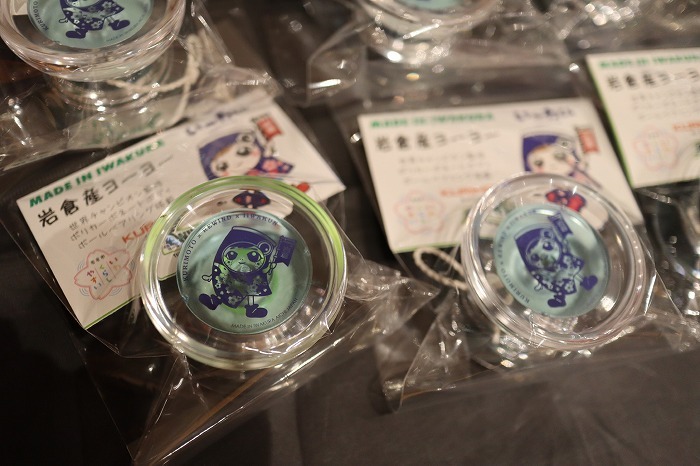 *Sakura Stream is the yo-yo we developed and produced with Iwakura city and Kurimoto, a plastic molding company in Iwakura. This event is one program of the “Yo-Yo Town, Iwakura” Project. 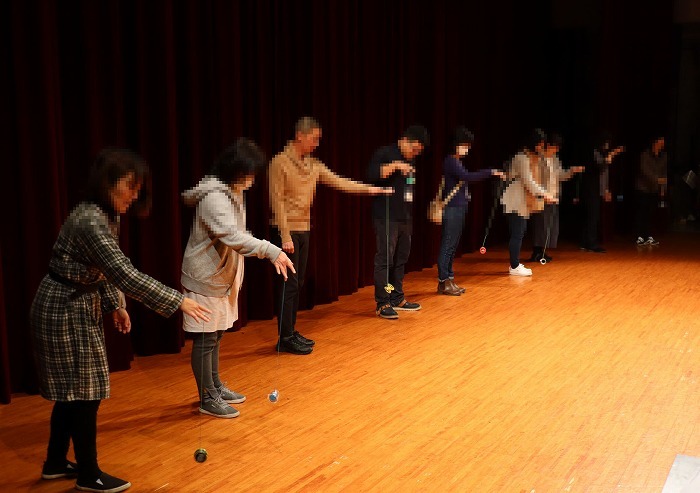 Everyone enjoyed many yo-yo games and activities. We had a teaching session. There were many first-timers there and they enjoyed their first yo-yo experience. With the experienced kids, we practiced basic moves through mini games. 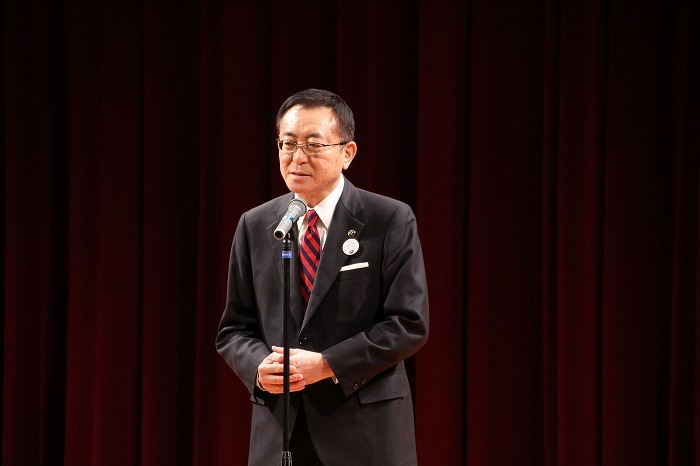 Iwakura City Mayor, Katsurao Kubota, came and gave a speech. Team battle! Team representatives competed on stage and showed off their yo-yo skills. Parents fight! Kids were so excited to cheer on their own parents who were on their same team. In the main division, Basic Compulsory Tricks, we had three kids tie and had a tie breaker! Koki Iwata won the main game! 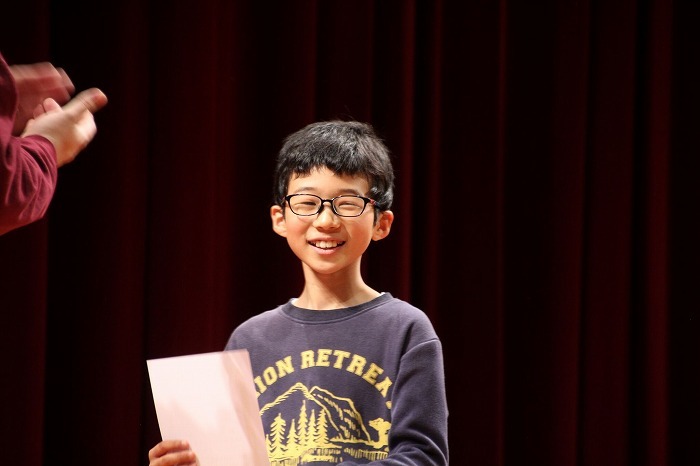 He didn’t do well in the last two contests (2018 Japan Junior and 2019 Central Japan), so he finally did it on his third try! Congratulations! On top of that, Koki’s father also won Throwdown Sudden-death. Koki’s younger brother also won Throwdown Sudden-death. All three won their games! There were some kids who did well and some who didn’t, but everyone enjoyed and showed their smiles at the end! It was our first contest specifically for this age group, but thanks to all the participants’ and staff’s help, we could have a successful event. Thank you! Also, big thanks to Iwakura City and Sightseeing Committee, and Iwakura Rotary Club for funding this event. Our goal is for everyone in the city to be able to play yo-yo! 2000 X Division World Champion, National Yo-Yo Master, and REWIND's commander-in-chief. Hiro earned his business degree at CSU Chico so he could be close to the heart of America's yo-yo community. He personally handles international communication and orders at REWIND. In his spare time he enjoys reading manga and watching movies.